This will be a quick one since I only had a few products used up for this month. Suave daily clarifying shampoo – This has always worked great for getting rid of product built up and freshening up greasy roots. At first I thought this was going to be discontinued since I couldn’t find it at Target for several weeks. Turns the packaging was just getting a revamp. Thank goodness. Not Your Mother’s Clean Freak Refreshing Dry Shampoo – My favorite product to use on days between washing my hair. It’s a fairly large sized can and priced under $10, and comes in both scented and unscented versions. Clinique Take the Day Off Makeup Remover for Lids, Lashes, & Lips – I was finally able to get to the end of this travel sized bottle thanks to my current experimentation with matte lip colors. I understand how not many like this remover because of the slightly greasy residue it leaves behind. In my case, I usually wash my face after using this. It gets the job done and doesn’t irritate my eyes or lips. All items listed here have already been re-purchased. In other news, I found out last week that I had reached my 3 year anniversary with WordPress. It’s a bit surreal to see how far I’ve come with this blog. I couldn’t have done it without followers/readers like you. Thank you so much! I’m rewinding a bit to the beginning of the year with this post. For those who haven’t heard of the International CES (Consumer Electronics Show), it’s an annual event held in Las Vegas. Thousands of industry attendees from around the world go here to check out the latest in technology. Aside from being immersed in exhibit halls full of tech, there are also off-site events that take place during the week of the convention. One that I got to check out was the Monster Retailer Awards, which was immediately followed by live performances. This year’s theme was a tribute to Michael Jackson. Magic Johnson and Christina Milian were the emcees for the evening. Performers included Ne-Yo, Joe Perry from Aerosmith, and The Jacksons. I would have never guessed I’d see MJ’s brothers perform live, ever! They are currently on tour in the US. Had to record some of the Jackson’s awesome set. Had some more fun at CES the following day. I checked out the demo of the Force Band at the Sphero booth. It’s to be used in conjunction with their BB-8 via Bluetooth in order to control it, and is to be released later this year. The most popular (and probably only) droid at CES. The Intel booth once again used their RealSense technology to make avatars of attendees for the game Fallout 4. Last year they used it to make laser etched cubes. Image of me after scanning with Intel’s RealSense technology. One thing that was in abundance this year were drones. From the widely known remote controlled ones to one that you can actually get inside of. Even Polaroid has their version of one! Check out c|net’s article about them. Here are a few more photos of what I saw and experienced during the event. Samsung Family Hub Refrigerator. Currently the smartest fridge out there. Some of the people I roomed with were finalists in TechCrunch’s Hardware Battlefield. They’re also on this year’s Forbes 30 Under 30 list. Lenovo’s event at The Venetian featured some of their latest tech, plus free food and drink. The DJ at this party kept things turned up the whole evening. I’m a sucker for fancy desserts! CES is a great reason to geek out in Vegas. I’ve visited for this purpose more in the past few years than my usual leisurely trip (unless it’s with family), and that’s totally fine with me. Of course, I made sure to check out food places and get in some shopping during my down time. Looking forward to next year if I decide to return. 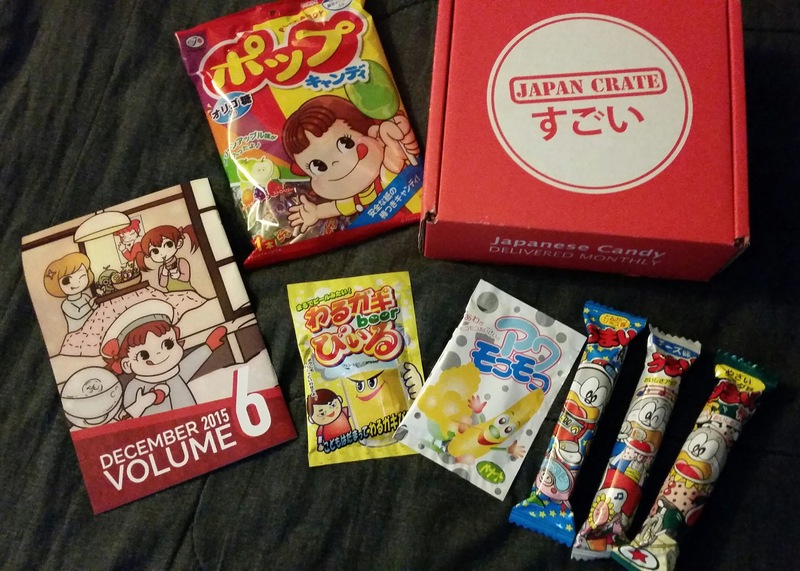 One box subscription that I’ve managed to stick with from last year is from Japan Crate. Their boxes consist of various types of Japanese snacks that are sent out monthly. I’ve been subscribed to their Mini crate since November, and have been seriously enjoying it. This will be a double review since I didn’t get a chance to finish trying everything from December’s box until last week. Fujiya lollipops – The bag contained 4 flavors: strawberry, grape, apple, and orange. Loved them all! Yaokin Umaibo – These are puffed corn sticks (think of an oversized Cheetos puff). I got them in cheese, veggie salad, and tonkatsu (pork cutlet) flavors. Again, loved all of them. Surprisingly I saw these the other day at Nijiya Market. They’re sold in packs of 10 for around $5. Bad Kid Beer – Beer in a packet. I know what you’re thinking! Nope, definitely not beer, and not too bad either. It was more like a grape flavored fizzy drink. Contents of the packet were added to water then mixed. Simple enough. 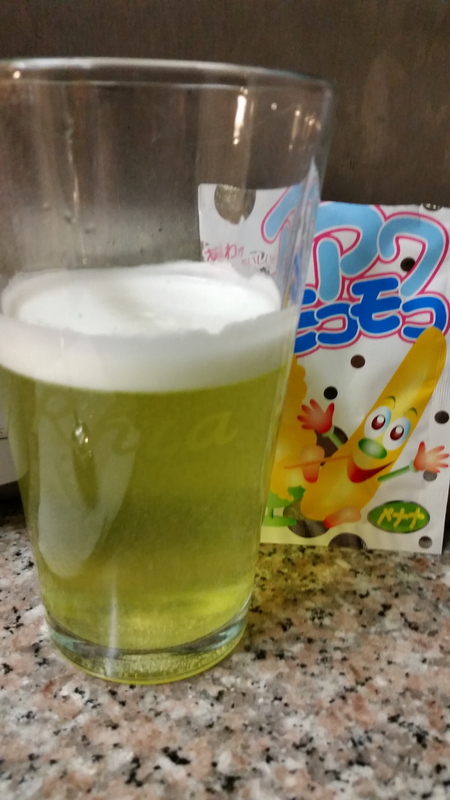 Awa Moco Moco – Another drink mix packet. This one was banana flavored. I instantly thought, “Ugh, this is going to taste artificial.” Again, the contents was mixed with water. The end result was a fizzy drink with a slight foam on top. The taste was definitely artificial, but not overwhelming. Calbee potato chips, Usushi Oasi – These chips were lightly salted. Very light and crisp with good flavor. Another gem I happened to stumble upon at Nijiya. I plan on eventually trying out a few more flavors. Strawberry Shortcake Ju-C – This tube of round wafer candy reminded me of oversized Smarties (US version). 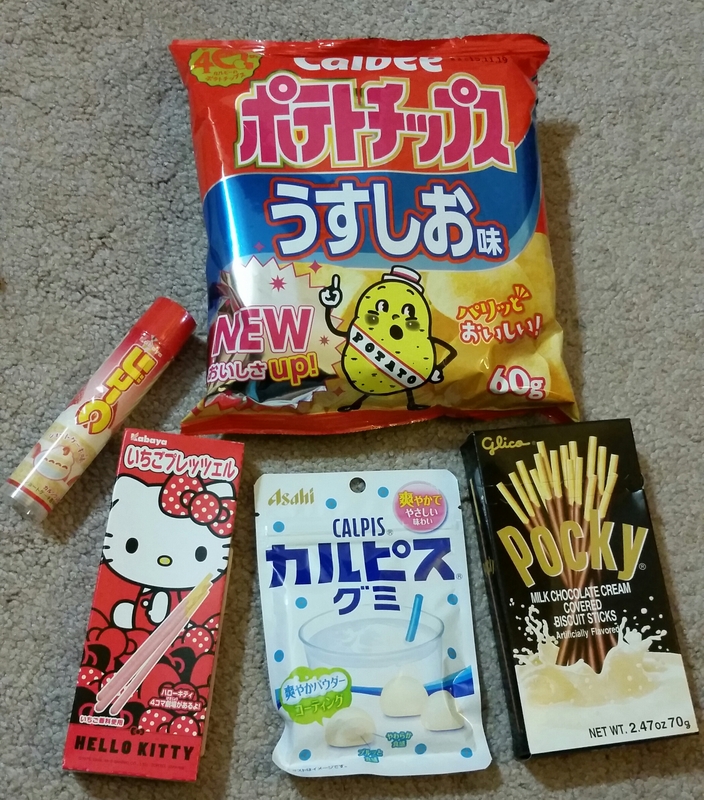 Hello Kitty Strawberry Pretzel – Just like Pocky, which I’m already a fan of. This was opened and devoured immediately. Asahi Calpis Gummy – These sugar coated jelly filled gummies taste just like the famous Japanese drink, also known as Calpico. NOM. Milk Chocolate Pocky – Saved my already established favorite for last! Just like its Hello Kitty predecessor, it was quickly put away. I pay $12/month for the Mini Crate, which includes free shipping (within the US). I’m currently working/munching on the contents of this month’s box. You would think 4-6 items would be easy to get through, especially since this is the smallest box they offer. But hey, good reviews ought to take some time to formulate, or in this case digest. Heheh! In the mean time, feel free to visit Japan Crate to see what else they offer in their monthly boxes. My bestie informed me about this new rewards program for M.A.C. If you’re a current (non-Pro) M.A.C.-aholic, your prayers have finally been answered. Info on how to sign up and perks of the program are all in the post. I know that you’re all shopaholics like myself, especially when it comes to beauty products, so it feels good to know there are programs that will reward you for all the spending you do. A couple of the more popular programs are the Sephora Beauty Insider program and the Ulta Ultimate Rewards program. Today, I dropped by my friendly local MAC Pro store to pick up a few products, and I found out that *drumroll* MAC has launched a new loyalty program called MAC Select. Similar to the Sephora program, there are three tiers, dependent on the cumulative dollar amount you spend over the course of a calendar year. One perk among all levels is free online shipping. Members have access to limited-edition products, as well. At all levels, you also get an annual free gift and free samples online. I’ve slacked off a ton with putting together my Project Life pages from the past few months, but I’m slowly getting back into the routine of setting aside some time to work on them at least every other week. I don’t take many photos to do weekly updates, so I document monthly highlights instead. Most of the elements used in these pages were from Studio Calico’s Arendal Documenter Kit. If any of you are also into Project Life/scrapbooking/paper crafting, I’d love to know what you’ve worked on or what you’re currently up to. Feel free to drop a link in the comments.